This Q&A Section provides a brief outline of key considerations in the construction of the Pobal HP Deprivation Index for Small Areas. The Pobal HP Deprivation Index builds on the innovative and powerful approach to the construction of deprivation indices developed in our previous research (Haase and Pratschke, 2004, 2005, 2008, 2010, 2011). The forthcoming 2016 Pobal HP Deprivation Index will provide an up‐to‐date analysis of relative affluence and deprivation, as well as the changes in deprivation that have occurred in each local area over the past five years. For a brief outline of the key features of all of the HP Deprivation Indices see Overview. The Pobal HP Deprivation Index is based on Small Areas (SA), the new census geography developed jointly by the Ordnance Survey of Ireland (OSI) and the Central Statistics Office (CSO) for the publication of the Small Area Population Statistics (SAPS) from the 2011 Census of Population. Before 2011, the smallest spatial units for which consistent SAPS data were available were the Electoral Divisions (EDs). However, EDs do not provide a homogeneous coverage of the spatial distribution of the Irish population, as they range from as low as 76 individuals in some rural areas to over 32,000 in Blanchardstown‐Blakestown. This unevenness in population generates considerable difficulties when mapping social and economic data. By contrast, the 2011 SAs for Ireland are much more homogeneous, with a minimum of 50 households and a mean of just under 100 households. This mirrors analogous revisions to the census geography in the UK and Northern Ireland. It is important to note that index scores that are constructed from the SA-level analysis cannot be compared directly with those based on an ED-level analysis. Q: What concept of deprivation do we aspire to quantify? Whilst indicators relating to attributes and possessions are used in a wide number of deprivation indices, the novel aspect of this definition lies in the inclusion of opportunities as a key aspect of deprivation. Opportunity deprivation lies at the heart of rural deprivation, which is of relevance to many areas in Ireland. In this respect, the Pobal HP Deprivation Index has a different conceptual basis to other indices and is able to provide a robust measure of relative affluence and deprivation across both urban and rural areas. Q: How is the Pobal HP Deprivation Index constructed? A: Most deprivation indices are based on Exploratory Factor Analysis, which automatically reduces a number of indicators to a smaller number of underlying dimensions or factors. This approach is taken a step further in the Pobal HP Deprivation Index: rather than allowing the definition of the underlying dimensions of deprivation to be determined by data‐driven techniques, the authors develop a prior conceptualisation of these dimensions, which is then tested empirically. Based on earlier deprivation indices for Ireland, as well as analyses from other countries, three dimensions of affluence/disadvantage are identified: Demographic Profile, Social Class Composition and Labour Market Situation. Demographic Profile is first and foremost a measure of rural affluence/deprivation. Whilst long‐term adverse labour market conditions tend to manifest themselves in urban areas in the form of unemployment blackspots, in rural areas, by contrast, the result is typically agricultural underemployment and/or emigration. Emigration from deprived rural areas is also, and increasingly, the result of a mismatch between education and skill levels, on the one hand, and available job opportunities, on the other. Emigration is socially selective, being concentrated amongst core working‐age cohorts and those with higher educational attainments, leaving a disproportionate concentration of economically‐dependent individuals, as well as those with lower levels of education, in the communities concerned. Sustained emigration leads to an erosion of the local labour force, a decreased attractiveness for commercial and industrial investment and, ultimately, a decline in the availability of services. Social Class Composition is of equal relevance to both urban and rural areas. Social class background has a considerable impact in many areas of life, including educational achievements, health, housing, crime and economic status. Furthermore, social class is relatively stable over time and constitutes a key factor in the inter‐generational transmission of economic, cultural and social assets. Areas with a weak social class profile tend to have higher unemployment rates, are more vulnerable to the effects of economic restructuring and recession and are more likely to experience low pay, poor working conditions as well as poor housing and social environments. Labour Market Situation is predominantly, but not exclusively, an urban measure. Unemployment and long-term unemployment remain the principal causes of disadvantage at national level and are responsible for the most concentrated forms of multiple disadvantage found in urban areas. In addition to the economic hardship that results from the lack of paid employment, young people living in areas with high unemployment rates frequently lack positive role models. A further expression of social and economic hardship in urban unemployment blackspots is the large proportion of young families headed by a single parent. 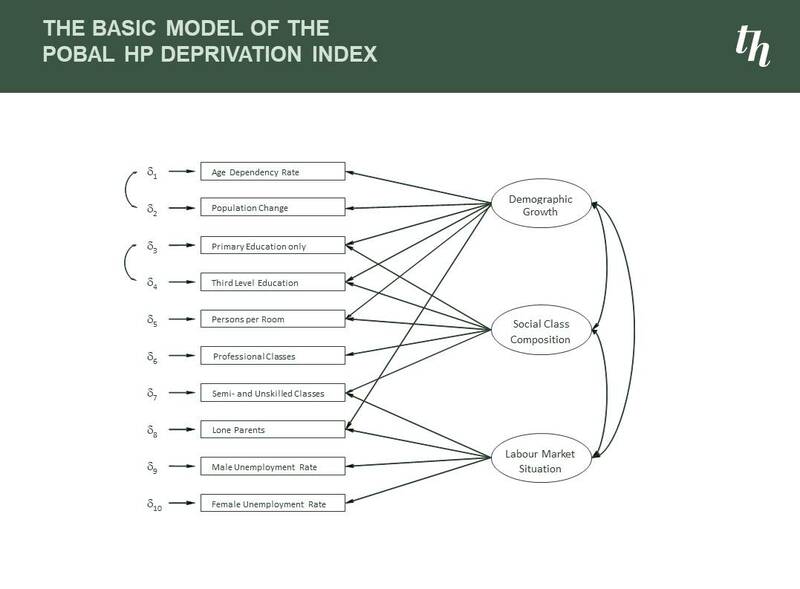 Q: What is the structure of the Pobal HP Deprivation Index? A: The figure below shows a graphical representation of how the concepts of Demographic Growth, Social Class Composition and Labour Market Situation are measured by ten key socio-economic indicators from the Census of Population. For enlargement, click on the slide. Q: What about other deprivation-related indicators which are not included in the Pobal HP Deprivation Index? Ireland is in a unique position in that it is the only European country that is committed to carry out a Census of Population every five years, and each new wave of data is quickly released. Policy makers can therefore feel assured that by using the Pobal HP Deprivation Index they are basing their decision on very up-to-date information. In jurisdictions where the Census is carried out every ten years (such as the UK and Northern Ireland), doubts about the accuracy and timeliness of information reduce reliance on the census when making policy-relevant decisions. Using Census data, and census data only, ensures the development of robust and stable concepts which maintain their validity and comparability over time and space. This is evidenced by the development of an All-Island HP Deprivation Index, using identical census variables for both jurisdictions. A crucial element of the Pobal HP Deprivation Index is that it is a truly multidimensional measure constructed at the level of census Small Areas (SAs). This means that all of the information used in its construction must be available at the Small Area level. By contrast, the Northern Ireland Multiple Deprivation Measures (NIMDM) are not multidimensional at this level, as the Small Area component is centred on income measures, other dimensions being incorporated at higher levels of spatial aggregation. Constructing a truly multidimensional deprivation index at the level of Small Areas requires very large datasets like the Census. By definition, this excludes indicators derived from survey data, as these would not be available for each of the 18,488 small areas in the country. Although it is, in theory, possible to draw on large administrative databases when developing indicators for Small Areas, this raises a number of difficulties regarding the stability of definitions and estimates, uniformity of treatment and the accuracy of data. Health indicators are not used in the Pobal HP Deprivation Index, primarily because deprivation indices are frequently used to predict/explain health and health-related outcomes. The inclusion of health-related indicators (such as those provided by the census) in the construction of the Pobal HP Deprivation Index itself would create a circularity in relation to one of its principle applications. Data on income and wealth could potentially be accessed from the Revenue Commissioners, although there would be major challenges regarding data protection. Income data also fluctuate considerably over time, across the life cycle and in accordance with family composition, which makes it more difficult to obtain stable and interpretable deprivation scores. Several studies point to the superior performance of a multi-dimensional measurement of income and wealth – preferably using Confirmatory Factor Analysis (CFA) – rather than relying on a direct measurement of income or wealth (see e.g. Tomlinson, Walker, Williams, 2008). Research on health and well-being in the US, where income data are routinely available, increasingly relies on composite indicators of deprivation, as these provide more powerful insights into socio-economic influences. Housing data could potentially be derived from the Census, or from very large administrative datasets such as the CSO’s Residential Property Price Index (RPPI) or commercial datasets. However, the RPPI uses the Pobal HP Deprivation Index as a key element in its construction, which would, once again, give rise to circularity. Secondly, the very meaning of housing indicators can change over time and space. Many questions recently asked with regard to the inclusion of housing indicators within the Pobal HP Deprivation Index relate to the 2008 recession and its after-effects. The latter include problems of negative equity, inflated house prices and the affordability of rental accommodation. However important they may be, these phenomena vary quite rapidly over time, and it would be impossible to ensure the continuing validity of any related indicators over coming years and decades. High levels of deprivation are generally observed in areas with high levels of local authority housing, which can easily be demonstrated using the Pobal HP Deprivation Index. It is for this reason that we typically supply information from the Census on the percentage of Local Authority rented accommodation alongside the Pobal HP Deprivation Index. This indicator is also included within Pobal Maps. At the same time, the inclusion of a measure of social housing within the Pobal HP Deprivation Index would give rise to a number of risks, and would again reduce the range of potential applications of the index itself. This is because the provision of social housing represents a type of benefit or social good. By reducing the supply of such housing, the level of deprivation in certain areas would appear to decline, if this variable were to be included in the index. This would be a contradictory and counter-intuitive result, as housing needs would actually increase in this case. For this reason, the authors have argued strongly against the use of benefit data and housing data in the construction of deprivation indices and are critical of their inclusion in the Northern Ireland Multiple Deprivation Measures (NIMDM) and the UK Indices of Multiple Deprivation (IMD). A number of environmental indicators could potentially be considered as indicators of deprivation. For example, there has been discussion about whether an urban-rural classification should be incorporated into deprivation indices (for a detailed discussion of this question, see Haase & Walsh, 2007). The authors have decided against this, as they believe that the way in which deprivation interacts with functional space and population density should be studied over time using sensitive multi-dimensional measures that capture the key aspects of deprivation. In many applications, it may nevertheless be useful to combine the Pobal HP Deprivation Index with the CSO classification of area types. A good example for this kind of approach is the LEADER Resource Allocation Model, which places an additional weighting on more rural areas. Analogously, the Resource Allocation Model for Drugs and Alcohol Task Forces assigns an additional weighting to more urban locations. By maintaining the distinction between deprivation and the urban-rural spectrum, these kinds of decisions can be made in a context-sensitive way. Another important aspect of the environmental context relates to transport. The National Transport Authority already uses the Pobal HP Deprivation Index to evaluate alternative transport routes. Inclusion of transport data within the index would thus lead, once again, to confounding and circularity. This is another example of how conceptual clarity is a virtue when designing deprivation indices, which are applied and used in many different ways and contexts, many of which cannot be determined in advance. Another interesting aspect of the environmental context relates to the quality of the local area, including potential hazards such as noise, water and air pollution and access to amenities and services. As in the case of health, housing and transport, the authors believe that the association between deprivation and the local environment should be studied empirically, rather than incorporating this within the definition of deprivation itself. Crime data have been used, in the past, in deprivation indices in other countries, but we do not believe that this would be beneficial to the Pobal HP Deprivation Index. One reason for this is the lack of consistent data and persisting doubts about the validity and stability of small area crime-related indicators over time and space. Policing is sensitive to political perceptions, operational decisions, public debate and local initiatives, which leads to systematic variations in how (and which) crimes are detected at the local level. In addition, it could be argued (as before) that one of the useful aspects of measuring deprivation at local level is that you can then explore how crime rates and the experience of crime and victimisation vary systematically across different kinds of neighbourhoods. Q: How can one proof the validity of the Pobal HP Deprivation Index? A: The ultimate proof of the validity and usefulness of the Pobal HP Deprivation Index lies in its ability to act as a reliable predictor to the social gradient that can be observed across those spheres where we are most concerned about the structuration effects of social class; i.e. in Health, Education, Income and Wealth, Housing, Environment and Crime. It is exactly because the Pobal HP Deprivation Index does not include indicators of these domains in its construction, that one can empirically test the ability of the Pobal HP Deprivation Index to predict outcomes in these domains. It is this ability, which provides the ultimate proof of the Pobal HP Deprivation Index validity. The consultants have recently finalised a study under a Framework Agreement with the HSE / Health Intelligence Unit in which they are providing detailed proof of the superior performance of the Pobal HP Deprivation Index when compared with other deprivation indices such as the SAHRU Index or the NIMDM. The superior performance of the Pobal HP Deprivation Index is closely related to a number the conceptual and statistical features described in the Overview section. We hope that the study “Deprivation and Health Impact Weighting” (Haase & Pratschke, 2017, forthcoming) will be published and made available on this website by the time of the launch of the 2016 Pobal HP Deprivation Index on Pobal Maps in mid-August 2017.